"Endless Love", our new exclusive creation in pure 925º silver and 24-carat gold for eternal love. The collection includes a stunning pendant and a ring dedicated to those who believe that tomorrow they will love more than today! Both pieces are true masterpieces of handmade carving. The sublime pendant features perforated spirals alternating with incised ones, alike a fine embroidery, while the ring has gold gilded spirals for a perfect match! 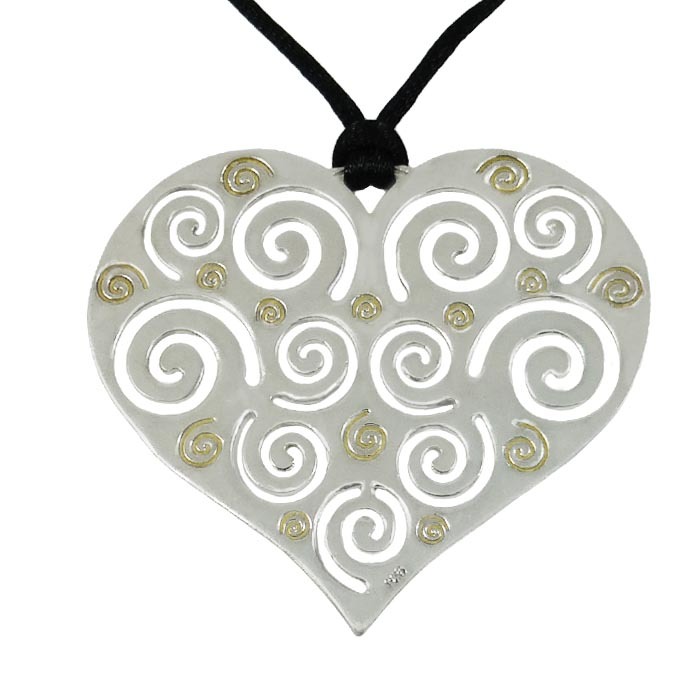 The pendant itself has a large size exceeding 6 cm and has a “double” beauty, as its one side is minimal and the other decorated with gold-plated 24K spirals! You can wear it bothwise! Offer today a memorable gift of love that will last forever, saying "from my heart to yours .. Check also the ring, a true masterpiece! The spiral is one of the oldest symbols and it was used since the Stone Age in Greece. It is one of the strongest - historic symbols of the ancient greek civilization and it declared the Greek origin of all things that bear it, especially before the classic period of the gold century and beyond. The spiral is unwound through myths, religious beliefs and legends. It is etched on rocks and in prehistoric megalithic monuments. The ancient Greeks were aware of the great mystical meaning of the spiral, so they drew it everywhere. From the temples and the shields of warriors, the depiction of the hairstyle on the gorgeous head of the Kouros statues, and on the ornament for the ancient women's hair and jewelry. It has been found painted on frescos in ancient Thera and also on many vessels from the Minoan age, that were discovered in Crete and Santorini. The heart is arguably one of the most popular symbols on the planet, as it appears literally everywhere. This symbol, however, is not supposed to represent the real human heart, but the stem of the plant silphium - a herb, which was popular for its contraceptive skills in Roman times. The heart symbol was even used in Roman coins.